Before the city council meeting on Monday, there was a meet-and-greet celebration in the Moorhead Center Mall atrium, giving city residents and business leaders a chance to get some face time with city officials. The event featured refreshments, cake and music by the Lollygaggers, with Clay County Commissioner Jim Haney as singer. One attendee, Julian Dahlquist, had volunteered on Judd’s campaign and knows other council members well, especially his mother, newly elected Ward 1 Councilwoman Shelly Dahlquist. “Their emphasis on community is going to lead to great things for Moorhead,” Julian Dahlquist said. Sara Watson Curry, Ward 1 councilwoman, said it’s great to get positive interactions with constituents. Judd said he’s going to continue former Mayor Del Rae Williams’ tradition of holding “Coffee with the Mayor,” with a few changes. In Judd’s version, the mayor will be joined by council members and meet at locations in each of the four city wards on a regular basis, instead of just at city hall. “We hope to continue these conversations with the community in the months to come,” Judd said. 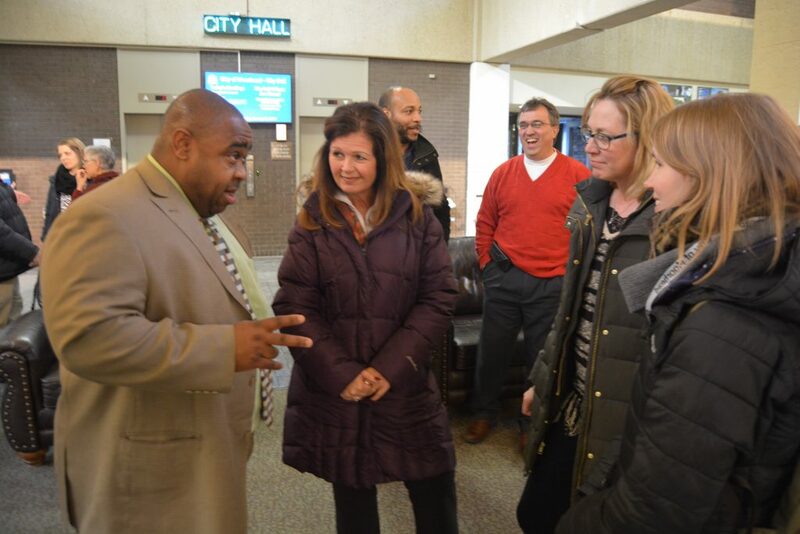 After the celebration, city leaders went upstairs for their last council meeting in January. Wade Kline of KLJ Engineering and Planning Services gave a powerpoint presentation with the highlights of a MATBUS Transit Facility Study. Due to growth in the system, leading to expected overcrowding at the 12-year-old Metro Transit Garage and concerns with the nearly 40-year-old Ground Transportation Center, MATBUS is considering some capital improvements over the next few years. The system averages more than 2 million riders each year, Kline said. In 2017, MATBUS saw 1,468,699 fixed route revenue miles. With a medium-growth projection, that’s expected to increase to 1,624,961 by 2022, 1,781,224 by 2027, 1,937,486 by 2032 and 2,093,749 by 2037. That growth means the Metro Transit Garage, which is already near capacity, will need to expand. Phase 1 of the project is expected to take place in the next 5 to 10 years and will include an expansion of the fleet maintenance area. Phase 2 would expand the rest of the building’s administration, contractor and storage and wash space. The project will cost $6.25 million, of which Moorhead would be responsible for a third, Kline said. Even though construction isn’t planned for a few years, Kline said, it’s important to have these projects “shovel ready” to take advantage of any available state and federal dollars. The project at the aged Ground Transportation Center will improve that facility’s roof, toilets, administration area, dispatch, mobility center, common space and canopies. Construction costs will be $2,472,172. The city of Fargo is responsible for direct capital costs, although some operational costs will be shared by Moorhead. Kline also presented plans for two potential transit hubs, one at M State in south Moorhead and another at the Dilworth Walmart. The Walmart project would cost $241,792, while the M State project would cost $408,475. It’s likely federal and state grants would pay for 80 percent of the projects and the cities (Dilworth in Walmart’s case and Moorhead in M State’s case) would pay for 20 percent. Kline did not offer a time frame for those potential projects. The council approved the transfer of $4,000 in DWI Seizure Funds and accepted $750 in grant money from AAA to fund the Every 15 Minutes education program at Moorhead High School. Moorhead Police Chief Shannon Monroe explained the Every 15 Minutes program during a presentation to the council. The program, which takes place over two days, simulates the effects of alcohol-related automobile fatalities for the student body and families. Every two years, police present the program to juniors and seniors, and it is scheduled around prom and graduation, when alcohol, though illegal for high schoolers, is often a part of the festivities. Since the program began in 2011, more than 5,000 Moorhead High School students have participated. And there have been no known alcohol-related fatalities among those students since that time. The city council granted a 2-year property tax exemption worth $6,400 to Michael Klindt, who plans to construct an 8-unit apartment complex at 2622 Country Club Parkway.